Alter-ego Biscuit Carroll just completed a Powerpoint Presentation in Second Life. This was done as part of the barcamp organised by Spin Martin, aka Eric Rice. 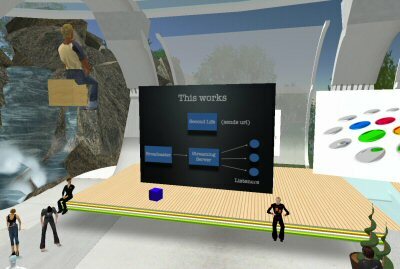 You’re probably wondering why you would give a presentation INSIDE a virtual world. Because this is a new way for corporates to hold meetings with personnel scattered across the world. A valid competitor to video conferencing, which is expensive and telephone hook-ups, which are difficult to manage with more than three people. The advantage of Second Life is its immersive nature and the fact that it’s a pretty enjoyable interface compared to alternatives. Was discussing at the Blog Meetup last night how virtual worlds and on-line games subvert normal hierachical power relationships. Suddenly it’s important how quickly you type. How knowledgeable you are about the medium you are using. This may be an advantage in a corporate environment, may be a disadvantage. We’ll know soon enough, as Free Beer is working with other consultants to bring this facility to the attention of interested businesses. Some presentations were done with audio streaming but my audio didn’t work. Highlights the complexity the user faces in this area. Quite frustrating to be standing there watching a mute avatar, knowing that all (or most) of those around you are listening in. In order to do the presentation, it’s necessary to save the Powerpoint Pres as jpegs, then attach a script to the screen you create. Instructions here. Make sure you load the jpegs into the Content tab. I tried to load them as textures. *Stupid Biscuit*. The presentation aimed to start a conversation about widening the exposure that bloggers and podcasters receive in mainstream media. Audience apparently unmoved. No-one asked any questions. Mental note to self. Next time, ask your own. The writing is on the wall for those looking for what is next in buisness. it is plain that Virtual worlds are here and maybe the next world of living as transistions to and from Virtual to real become more common. Virutual business is here, internet business was jsut the first step. Fiction has already taken us here years ago. Some see Second Life as just a playground or a glorified chat space. Some of us see it as a golden opportunity of life to explore or even develop those parts of ourselves that say “I wish i could be…” In Second Life I can be what I can’t in RL and do things I can’t in Real Life, and being somewhat older i have managed to avoid the bad decisions i made i youth. On the business side people are just beginning to see the potentials. Biscuit made a small error, not the first that an y have made. I have learned thtat one must thik about how Everyone accesses second life and all sorts of systems that can access secodn life do not include the best aduio or best graphics ot get a wider experience of the potentials, so typing is a must. Doing this I have taken the time to be a bit slower. As Biscuit knows when i type fast, my spelling goes down the toilet. Virtual conferencing has huge potentials but the commonality is probably going to be typing till better interent connections exist along with better software, better audio software and hardware, faster connections to go with our fast PCs. Once all thes come togetehr then a virtual conferencing will sky rocket as it is easy way for people anywhee to become involved with a buisness venture. Already one can see places that have taken advantage, the first place that a person can find it is in the fashion industry as fashions in Second Life have quiete easily outstripped reality and I know that some have taken designs form SL and put them into reality. That is just a small example of what has hit the real world. Think outside the box, don’t be too critical of the faults of secodn life and look ahead at the potentials of buisness once hardware and softwear gets close to where our minds are already and just think about how any business can expand its marketing and its potential customers.